So maybe you went to the doctor’s office or that fancy new restaurant, and while you were there, eyed that fabulous saltwater aquarium? Something about it appealed and fascinated. The beautiful hues of the many fish perhaps? The calm, soothing fronds of coral slowly moving as though in a gentle wind? Whatever the appeal, you decided you had to have one for yourself, so you didn’t have to visit anywhere to see that beauty – you could sit in the comfort of your own home and watch those fish swim peacefully while enjoying your morning coffee. By taking the plunge, you’ve undoubtedly discovered that reefkeeping is a labor of love. The more you bought; the more you studied – the more you were determined and committed to a great tank and your fish. Your own fish and coral in your own home require input from you to take care of them to be happy and healthy. Above all, saltwater fish need salt. And it would never do just to pour table salt into the water, they need special reef salt. Since your fish and coral deserve only the best, you had best find out what the best reef salt is for you, and so you ended up here. In this article, we are going to help you make the right decision when it comes to salt for your particular reef or marine tank. We are going to discuss some basics and background of reefkeeping – particularly when it comes to the use of salt – and we will end with a list of our recommendations for the best reef salt available today, along with pros, cons, and other useful information. What is Reef Aquarium Salt? Why Might You Need It? What is Specific Gravity? Why is it Important? What’s in Your Tank? What do They Need? To understand why you need reef aquarium salt, you first need to understand why saltwater fish need salt, and why they will die if the salt balance isn’t correct. Saltwater fish evolved in the very salty environment of the ocean. Every living thing, including fish, needs to drink water to survive. Everything, including humans, also need salt to survive. But too much of it is dehydrating. So to survive this, the saltwater fish had to evolve ways to take in all the water they needed, while not too much of the salt. The salt content of water is known as salinity, and ocean water is about 3.5 percent salinity. Freshwater is only about 0.1 percent. So freshwater fish don’t constantly have to get rid of lots of salt to stay hydrated. Therefore they have evolved differently. How fish use and get rid of salt in their bodies is called osmoregulation. Saltwater fish drink lots of water and only get rid of a little salt. Their bodies get all the salt they need from the ocean water. Freshwater fish need salt too, but there isn’t much of it in fresh water. So their bodies are designed to keep the salt they need and get rid of all the water they don’t. Fish pee in the ocean! Saltwater fish pee only a little to hang onto the water they need, and get rid of the salt they don’t. Freshwater fish pee a lot to hang onto what salt they have and get rid of the excess water they don’t need. Therefore, if you put a saltwater fish in fresh water, its body is designed to drink lots of water and get the salt it needs from the water it’s in. Its body evolved to get rid of salt and not keep it. If you put it in fresh water with almost no salt at all, it will not have enough to survive, therefore will soon get sick and die. In a reef aquarium environment, you have to add salt to your water, so your fish get the right amount of salt they need. That’s why you need reef aquarium salt, a professionally prepared mix of salts your fish need to survive and be healthy. This video offers excellent information on aquarium salinity. Salinity, the concentration of dissolved salt in water, is often measured in parts per thousand (PPT). Practically speaking, instruments used to measure aquarium salinity can’t determine that. So instead they use a concept known as specific gravity. Specific gravity is the ratio of the density of any liquid as compared to the density of pure water. Density is the measurement of how much is packed into a certain space, be that a solid or a liquid. It is calculated using mass divided by volume. Think, for example, if you had two large jars of the same size. One contains potato chips, and one contains pennies. The jar with potato chips would be less tightly packed and also lighter. The jar full of pennies would be more tightly packed and much heavier. Measuring the density of a solid or liquid therefore allows you to determine how much of something is in it. You can’t see dissolved salt in water. But if you have a way to measure the density of that saltwater, then you can tell how much salt is in there. For scientific purposes, the density of pure water with nothing in it is defined as 1.000 g/cm3 at 39.2 degrees Fahrenheit. Adding something to the water will make this number fall or rise. Adding salts to it makes it rise in predictable ways. Therefore, you can use specific gravity to measure how much salt is in a volume of water. Seawater isn’t just salt, it also includes so many trace elements. Your fish need these elements, which are all contained in commercial reef salt mixes. Different species do better with different specific gravities and different trace elements. Your tank could contain just fish, but most tanks also contain corals. Corals need more trace elements than fish. Before you buy salt, you have to consider what species are in your aquarium and what they need – both in terms of trace elements and specific gravity. Any tank must have the right levels of magnesium, calcium, and alkalinity to succeed. But what are they and why are they important? Calcium is needed for coral growth. It also helps maintain the pH of the water. pH is a measurement of how acidic a liquid is, like vinegar, or how alkaline it is, like soap. Your fish absorb everything through the water they are in, so need the right pH to thrive. This is basically a measure of the level of the bicarbonate in the water, which is needed for corals to create their skeletons. Alkalinity in aquarium keeping measures how much acid is required to drop the pH level to 4.5. Practically speaking, the alkalinity level in the tank will either encourage coral growth or make it hard for them to grow. This is important for several reasons. First, magnesium it is abundant in seawater. Second, magnesium ions bond well to bicarbonates which are essential for corals. This pairing both increases the bicarbonate levels and stabilizes the pH. In other words, there are more bicarbonates for your corals to use for growth. It also makes it easier to maintain the right pH. Corals take in magnesium to complete their skeletons, so that also helps them grow. If you have plants in the aquarium, they may also benefit from it. Additionally, magnesium prevents overgrowth of calcium carbonate (white crust) in the aquarium by bonding to the calcium and carbonate ions, helping maintain proper calcium and alkalinity levels. This video delves into why magnesium is so essential for your tank.It is, therefore, crucial to choose a salt that establishes the right levels of magnesium, calcium, and alkalinity for your particular tank species. Reef salt is a major and essential expense of keeping a saltwater aquarium. Calculating the cost per gallon by dividing the number of gallons by the total price will help you get the best deal. 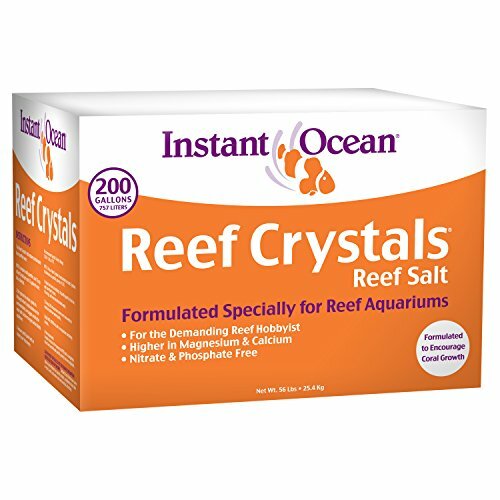 We looked at the many salts available, their contents, price, user feedback and overall perception of the product in the market, to pick what we believe are the best reef salts for marine aquariums available today. This seems to be an excellent choice for those having difficulty maintaining tank chemistry. It tends to keep those difficult levels under control, even and balanced. Very popular with enthusiasts, it is easy to mix. Brightwell painstakingly researched and manufactured this product to contain trace elements that match what is found in ocean water. We like Brightwell’s years of research they put into this salt, based off solid principles of marine biology and chemistry. Their precision formula of making this salt replicate natural seawater as closely as possible creates the result of smoothly balanced tanks. Additionally, users save money by not then needing to buy supplements such as magnesium and calcium. Another favorite feature is how easy it is to mix. As specific gravity is so important, users report they love how simple it is to achieve with this salt. Detailed instructions help even new aquarium owners get it right. This product features a relatively low alkalinity level, so users have reported it works well if you need some type of biofuel for your tank. This product also features an excellent nutrient balance for everything in the aquarium. It works very well if you run a low nutrient system. 134 grams per US gallon of purified water yields a specific gravity of ~1.025 g/cm3. Formulated to precisely match the elements and the trace elements found in ocean water. Great for low nutrient systems. Works for hard and soft corals. Some users report it has a slight smell. In short, this is a good solid choice for all kinds of tanks. It’s so super easy to mix that even a beginner would have trouble messing it up. Not to mention, it adds key nutrients that will benefit and balance your tank. There is a good reason as to why aquarium enthusiasts love it so much. Check out more about it here. This is an excellent buy if you stock corals. For a fish-only tank, other products may be better, but this formula is designed to maximize the health and growth of your corals without killing your wallet. The biggest feature of this salt is it’s a lot of bang for your buck. It’s composition is very similar to more expensive salts and therefore gets good results at a fraction of the price. Another feature is it’s formulated specifically for corals, packed with extra calcium, trace elements, and vitamins to encourage coral growth and health. Contains high concentrations of essential ocean reef elements. Specially produced for reef aquariums. 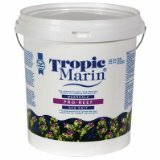 Contains extra calcium to ensure coralline algae and stony coral growth. Added trace elements provide essential vitamins and nutrients to ensure rapid growth and survival of corals, anemones, etc. Neutralizes water from the tap. Packed with calcium, trace elements, and vitamins that corals need. Neutralizes the heavy metals sometimes found in domestic water supplies, ensuring they don’t upset your tank’s chemistry. The product often arrives hard or clumped. Doesn’t dissolve as quickly as other brands. 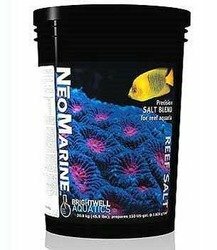 If you have a coral-heavy tank and budget is an issue, this may be a good salt for you. It’s great for neutralizing the hard water from your tap that you may be using to fill your aquarium so that your beautiful corals thrive. Not to mention, the extra calcium in this formula will promote healthy coral life. This salt has been an industry standard for years and is the choice for large commercial aquariums. It’s incredibly versatile, and it works with just about any setup. The main feature of this salt is it’s budget-friendly. It’s a good all-purpose product that will do for most setups. As keeping a reef aquarium can be expensive, this is an important consideration. Additionally, it is fast-dissolving, nitrate, and phosphate free. The fish and coral of your aquarium will be healthier with the lack of additives. Carefully formulated, this is the most universally preferred sea salt. The first choice of enthusiasts and professionals alike. The product has set the industry standard for quality, consistency, and value for over 50 years. Versatile and works well with most setups. Becomes hard or clumped during storage. Doesn’t mix into the water easily. Some users report it clouds the water. For its reasonable price and versatility, this is the choice of most large commercial aquarium owners and should work well for you. 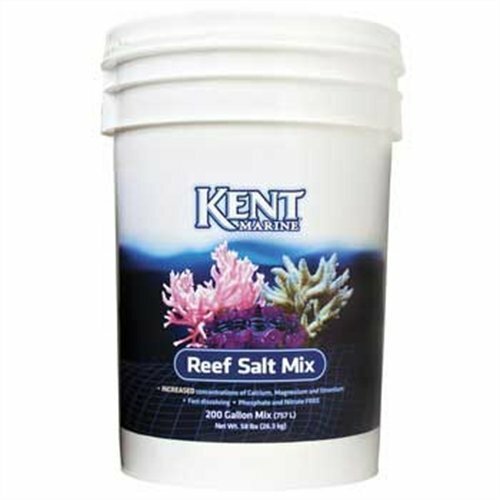 Both your fish and your coral’s health will benefit from this quickly dissolving salt that even professionals trust. Red Sea salts are literally harvested from the Red Sea of Bible fame! As such, they are already organically balanced to support marine life. This natural balance and the trace elements will help balance your tank chemistry. 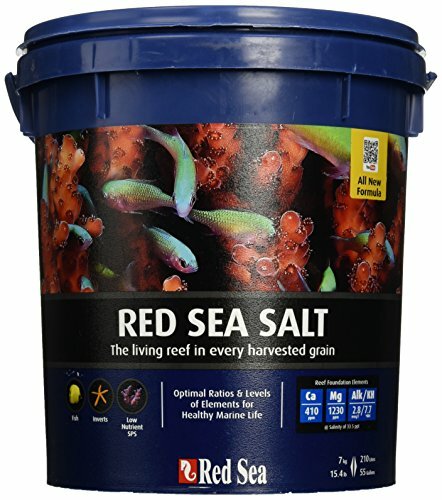 The outstanding feature of Red Sea salts is they are from a body of water containing diverse marine life and therefore contain everything necessary to support that life. Nature has created the perfect ratios – not man. The final product you get is very similar to the measurements in the actual sea. Another feature is it doesn’t contain nitrates and phosphates which foster algae growth. The salt also doesn’t contain toxic levels of heavy metals or chemical binders to mess up your tank chemistry. A great feature and benefit to corals, especially hard ones, and invertebrates, is the extra trace nutrients they need. It is, in fact, heavy on nutrients, so if you usually replace nutrients a lot, this will cut down on that. All-natural eco-friendly harvesting from the Red Sea. Biologically balanced foundation element levels. All essential trace elements included. No phosphates, nitrates or toxic levels of heavy metals. Produces stable seawater with a pH of 8.2–8.5. Sourced from natural seawater so contains all elements needed in natural ratios. No heavy metals or chemical binders. Extra nutrients can cause algae overgrowth in a lightly stocked tank. This nature balanced, nutrient dense salt should make your coral and fish thrive in a well-populated tank. Keep in mind though, that if your tank isn’t very crowded, you might end up with a bit of algae. Otherwise, this is a great choice because it’s phosphate- and nitrate-free, and doesn’t contain any heavy metals. With the same great advantages of the other Red Sea product, this one is slightly altered to meet the specs of tropical reef water. The higher alkalinity and full complement of nutrients make it a good choice for a low-nutrient system. This salt is designed for SPS-dominant, ultra-low nutrient SPS, and marine fish environments. Its alkalinity of around seven is ideal for those situations. Additionally, it dissolves quickly and cleanly, making your work easier. No nitrates, phosphates or toxic levels of heavy metals. A full complement of nutrients. Alkalinity ideal for SPS-dominant, ultra-low nutrient SPS, and marine fish environments. If your aquarium has one of the above environments, this robust, nutrient-packed salt will suit your tank well. We appreciate that it’s ethically sourced from the Red Sea, which is famous for having stunning marine life and coral reefs. 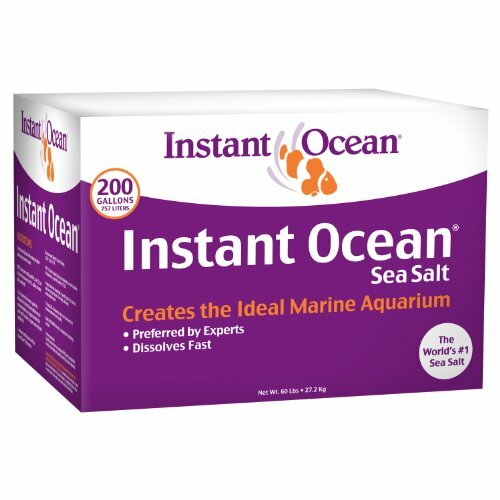 A popular product with users, this salt contains extra calcium, magnesium, and strontium for coral health and growth. It is a high-quality product for a reasonable price, and it is easy to obtain. One of the features of this salt is it seems to balance tank levels quite well according to pleased users. This cuts down on the use of additives and therefore costs. This salt is easy on the pocket at a reasonable price, yet the quality compares to much more expensive products. Extra calcium, magnesium, and strontium really promote coral growth and health. Magnesium is a tank balancer by itself, so this may be why this salt does so well doing that. Contains elevated levels of magnesium, calcium, strontium and other elements. For fish-only and reef aquariums. High-quality at a reasonable price. Can arrive hard instead of powdery form. This is a very well rounded, good middle-of-the-road salt. It’s great for tanks with just fish or just corals, or with both. By adding extra magnesium, calcium, and strontium to the water, your tank and corals will be healthy, thriving, and happy. Coralife uses scientific-grade salts and microprocessing to ensure even, fast dissolving. The blend balances trace elements and helps provide correct pH levels. A great feature of this product is the salts are of scientific grade or pure enough they can be used in experiments. Therefore, they’re good for your both your fish and your coral. Many enthusiasts complain that salts can be hard or clump and not dissolve well. Coralife’s salt, on the other hand, features microprocessing for an even texture that won’t clump and will dissolve quickly. Also, it not only helps balance magnesium and calcium, but it also helps balance the all-important pH. Balancing multiple elements of tank chemistry in one salt is a useful feature that makes for easy fishkeeping. Micro-processing ensures a uniform blend of all elements required for a successful marine aquarium. The fast-dissolving formulation contains ingredients that provide the proper pH and optimal levels of magnesium and calcium. Great for balancing your tank. This is a good overall salt that most users are pleased with. It is of very high quality, extremely effective, and not to mention, easy to use. It dissolves fast, balances your tank’s pH levels and other vital elements necessary for a healthy, happy aquarium. This highly recommended salt mixes pharmaceutical-grade salts in a natural seawater ratio. Its faithfulness to seawater and lack of additives means it balances tank chemistry very well. The real draw of this is the pharmaceutical-grade salt. Being appropriate for medical use in humans, means it will naturally be pure enough to be great for your fish and also for the tank’s coral. Another feature is the faithfulness to seawater and the elements in it. This salt has 70 trace elements, so is exceptionally complete this way. We like the feature of no additives very much. Your fish wouldn’t be swimming in additives in the sea and absorb everything through the water. So your fish, therefore, won’t absorb chemicals their bodies aren’t meant to handle. 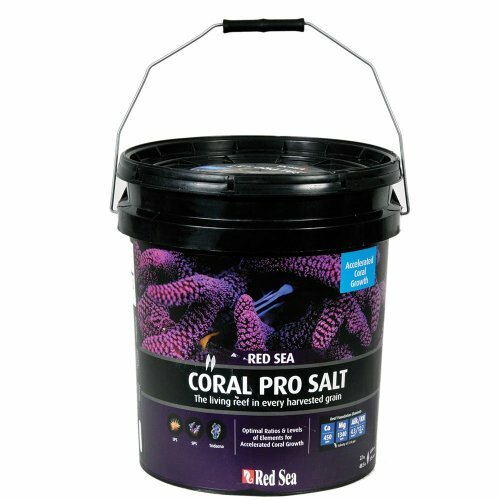 If you have a coral-heavy tank, this salt will help them calcify and build minerals. Produced with pharmaceutically pure salts. Contains all the elements of tropical seawater in their natural ratio. Optimizes magnesium and calcium concentrations, plus alkalinity and pH. The mixed crystal method ensures the 70 trace elements are completely soluble. No phosphates, nitrates or other unnatural enrichments. Particularly suitable in connection with mineral additions and calcium reactors. Ideal base for the care of fish, corals, and other invertebrates in modern reef aquariums. Faithful adherence to ocean elements. Ships from Germany so international shipping costs for most. If your budget allows, this is an excellent, highly recommended and popular salt – bearing in mind the cost of international shipping. However, the pharmaceutical grade salts in this product make the investment worth it. There are no unhealthy additives, and it will help your corals grow with the optimized calcium and magnesium concentrations. 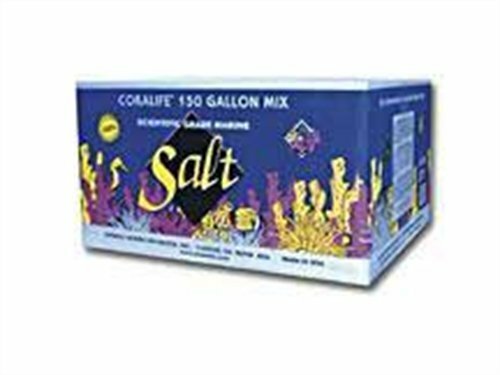 Reef aquarium salt is a vital component of any marine or coral aquarium. Fish and coral health and growth are utterly dependent on it. Therefore it’s important to choose the right salt for your tank and its inhabitants – and of course, your budget. We hope this buying guide and these recommendations helped. If you have questions or feedback, please drop us a line in the comments below, we’ll respond to every message.